A fifth of Swedes do not use automated teller machines. 4,000 Swedes have implanted microchips in their hands, allowing them to pay for rail travel and food. Cash is being squeezed out so quickly half the nation’s retailers predicting they will stop accepting bills before 2025. Financial authorities are asking banks to keep notes and coins. 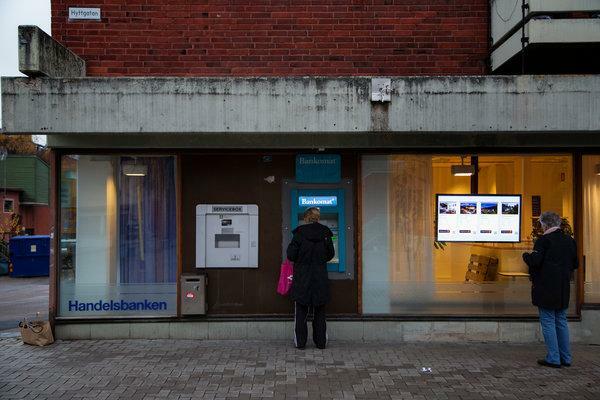 The central bank is testing a digital currency — an e-krona — to keep control of the money supply. Lawmakers are exploring the fate of online payments and bank accounts if an electrical grid fails or servers are thwarted by power failures, hackers or war. Urban consumers worldwide are increasingly paying with apps and plastic. In China and in other Asian countries rife with young smartphone users, mobile payments are routine. In Europe, about 1 in 5 people say they rarely carry money. In Belgium, Denmark and Norway, debit and credit card use has hit record highs. But Sweden — and particularly its young people — is at the vanguard. Bills and coins represent just 1 percent of the economy, compared with 10 percent in Europe and 8 percent in the United States. About 1 in 10 people paid for something in cash this year, down from 40 percent in 2010. Most merchants in Sweden still accept notes and coins, but their ranks are thinning. Among 18- to 24-year-olds, the numbers are startling: Up to 95 percent of their purchases are with a debit card or a smartphone app called Swish, a payment system set up by Sweden’s biggest banks. Ikea, whose flat-box furniture is a staple of young households, has been experimenting to gauge the allure and effect of cashless commerce. In Gävle, about 100 miles north of Stockholm, managers decided to go cashless temporarily last month after they realized that fewer than 1 percent of shoppers used cash — and Ikea employees were spending about 15 percent of their time handling, counting and storing money. “We said, ‘If you want a 50-cent hot dog, be my guest, take it. But next time maybe you can bring a card,’” said Burstein, 38. The test so far suggests that cash is not essential and, instead, may be costly, he said. “We’re spending a lot of resources on a very small percentage that actually need the service,” he said. Christine Lagarde, managing director of the International Monetary Fund, noted recently that several central banks are “seriously considering” digital currencies.